Can we claim a skincare product to be chemical free? I find natural and organic skincare fascinating, a never ending journey of discovery and education. In my eyes, mainstream beauty (the stuff normally found in Boots/Superdrug) was never this exciting. Bloggers and brands show great passion in their aim of living a "greener" lifestyle. I am always learning and my opinions are forever changing and evolving. 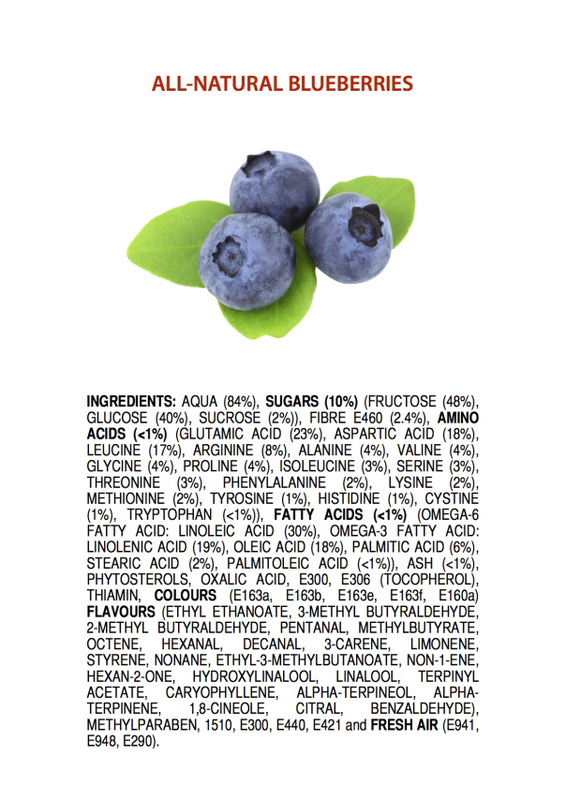 When I first started trawling the internet looking at ingredients and natural skincare, I noticed it was popular to advertise products as "chemical free or non toxic". It was (and still is) a blanket term referring to cutting out SLS, parabens, petrochemicals and similar ingredients that raise concerns. I always felt that unless you are following a holistic lifestyle this phrase probably means very little. It requires you to have an understanding of certain ingredients. 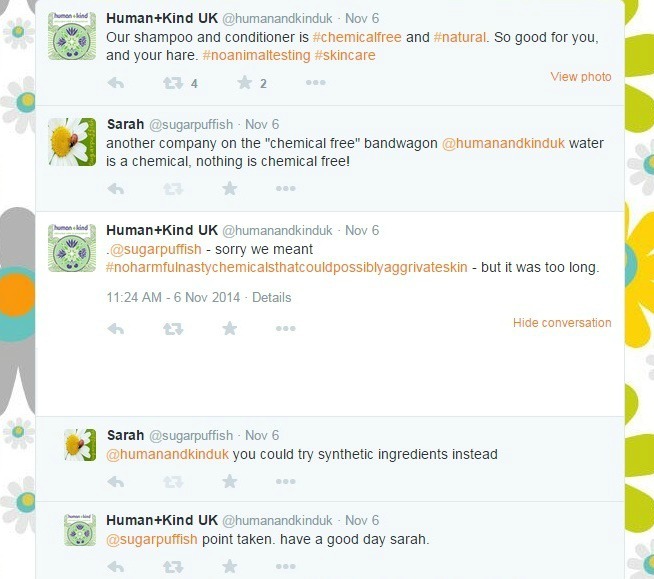 I recently questioned Human & Kind (on Twitter) on their use of the term "chemical free". You can see the conversation we had below. I appreciate the limitations of twitter and 140 characters is restrictive but Human & Kind also use the term on their website (it's right there on their home page). Of course, they are not the only ones doing this but for the purpose of this post they drew the short straw as my example. I'm sure that will come back to haunt me. I could spend all day picking apart their ingredients. Yes, products do contain ingredients of natural origins, like aloe vera or shea butter but can you really claim "chemical free" when I spy ingredients like Butylphenyl methylpropional (a synthetic liquid with a floral aroma) or Parfum? Lets not forget water is a chemical. I am aware that the environment around us and our bodies are made up of chemicals. Ingredients that are derived from natural sources can often go through laboratory processes. One example is Cocamidopropyl betaine which is derived from coconut but classed as a synthetic surfactant. As for “toxic free or non toxic”, Alex from Skinsmatter.com, made an interesting point in a recent article, “What too many appear to forget or ignore is that toxicity is not a characteristic of a chemical, but of a chemical at a specific dose.” That sentence pretty much sums up why I think marketing non toxic is a grey area. Even natural ingredients can pose health risks, not all mushrooms are safe to eat and sunlight can cause cancer. I would like to see companies drop the tag lines "chemical free and non toxic". I would rather we turn our attentions to ingredients that matter, the ones that benefit our skin and are better for the environment. I am perfectly happy for companies to mention that products are free from synthetic ingredients and identify which ones they avoid. You'll often see me referring to "undesirable ingredients" not sure if that works for marketing but I am comfortable it is suitable for blog posts. Can we claim a skincare product to be chemical free? For me the answer is no. I will leave you with this food for thought. Yes, undesirable ingredients was a good term I think! Chemical-free is an expression that I never use in my blog and does not have much meaning for me. This expression has been initially and unfortunately wrongly used in the natural and green world to defend the use of "un-beneficial" and unwanted ingredients for the skin. it is also important to point out that there is a vast arrays of chemicals that are naturally produced in the body/environnement and are not at all harmfull. I hope to explain that in a post sometimes! Someone said to me this weekend: what did our ancestors call organic food? The answer is food. So too, what do we use in products that sit on shelves? Chemicals. Not all are toxic and harmful though. I love this post and love the distinctions that you make. Honesty and integrity in a company is a value to me. If they are misleading the consumer in one area, perhaps they are doing so in other areas too. Or perhaps they are not careful about their marketing claims which sends another message as well. Thank you for calling this to our attention. I love that question about organic food, very true indeed. I agree with you about raising questions in your mind about the integrity of a company. I wasn't impressed with the rather blunt attitude I received on twitter. It's really tricky. We've used 'free from undesirable ingredients' too - but again, what's undesirable to one person, may not be to another - so it's probably imperfect. There's no 'umbrella' term which is ideal, I don't think. My other issue with the H&K tweets is the assumption that natural is necessarily good for you. The ivy example above should remind us it isn't. Another point is that it very much depends on the individual. Some people react horribly to natural fragrance allergens present in thinks like natural cinnamon oil, natural lemon oil and other natural oils. I agree it's a tricky area and I see how "undesirable ingredients" may not suit. I hadn't thought about what H&K said re: natural being good for you because of course you are right, not everyone can handle natural ingredients. Chemical doesn't need to be a dirty word but I think it needs to be used in the appropriate context. I agree the focus should be more on the beneficial ingredients. Interesting point you have raised that the "greenwashers" are the ones who are perhaps more to blame for the chemical free phrase which I am speaking out against. Good piece Sarah. This is also important: 'Chemical toxicity is a sliding scale, not black and white – whether a chemical is naturally occurring or man-made tells us nothing about its toxicity.' It's convenient for us to brand everything that's not natural as bad, but this is way too simplistic. took me a while but I've come around to that way of thinking, definitely more inclined to question a company using the term "chemical free"